Rare literary works, including newspapers, manuscripts and printed books, have been digitized to ensure their preservation in the Manuscript Library in central Turkey's Konya province. The second largest of its kind after Süleymaniye Manuscript Library in Istanbul's Fatih district, the Konya library is home to 30,000 manuscripts belonging to prominent Muslim scholars, including the great Sufi mystic Mawlana Jalal ad-Din Rumi, Sufi metaphysician Ibn al-'Arabi, Sufi philosopher Sadr al-Din al-Qunawi and Ibn Sina, one of the most significant thinkers and writers of the Islamic Golden Age. 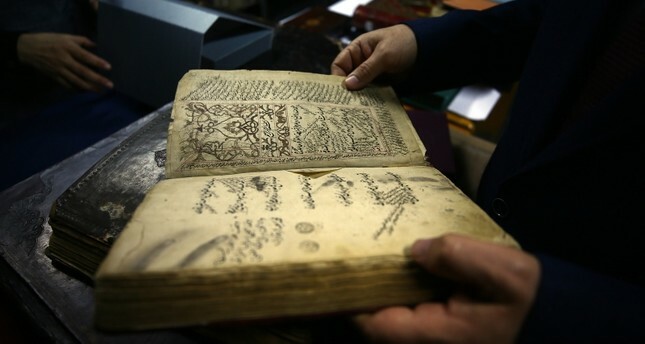 The Seljuk-era books, some of which are handwritten, are kept in a special section in the library. The works, which have been damaged over time by physical, chemical and biological factors, were first examined and then repaired by experts who cleaned the dust and mildew from the old book leaves and patched holes caused by insects. The books were re-stitched after the restoration and repair work was completed and many have been included in a digitalization process for preservation as well as to provide easy access to them. The library currently holds 140,000 literary works in seven different languages – Arabic, Persian, Armenian, Syriac, Kurdish, Ottoman Turkish and Chagatai – while the Edict of Ottoman Sultan Abdülhamid II, a 17th-century Bible from Rome and Ibn Sina's book "The Canon of Medicine" are one of the most noteworthy works. Konya, which has been listed as "Capital of Seljuk Civilization" in UNESCO's World Tentative List since 2000, offers unique insights into the Seljuk civilization's ancient mosque, madrasas and other architectural wonders. As a young boy, the great Sufi mystic Rumi came to Konya, then the capital of the Anatolian Seljuks, where he spent most of his life and died in 1273. It was there that his son founded the Mevlevi Order, also known as the Order of the Whirling Dervishes, famous for the Sufi dance known as the Sama ceremony, to perpetuate his father's teachings.